COVER LENS, touch panels, touch panel sliver electrode, light guide plates, luminescence plates, blood glucose test strips, printed circuit boards, film keypads, mobile phone cases, artwork printing, etc. 1. Ballscrews in the four posts allow for synchronous ascension and descension (the first company to use this system, and other companies have been busy imitating). Accurate positioning for the frame, without the extension problem due to long-term chain usage. 2. A servomotor, timing belt, high-precision linear guide, electromagnet positioning were used for table positioning. Precise positioning. 3. CCD registration system employs advanced Japanese registration software for highly precise and efficient registration. 4. Air-pressure parts from German manufacturer FESTO are used for the entire machine for ease of replacement and guaranteed quality. 5. Optional devices: Full-screen dust cover or half-screen dust cover. 6. Safety threshold device installed to ensure user safety. For detailed specifications, inquiries are welcomed! 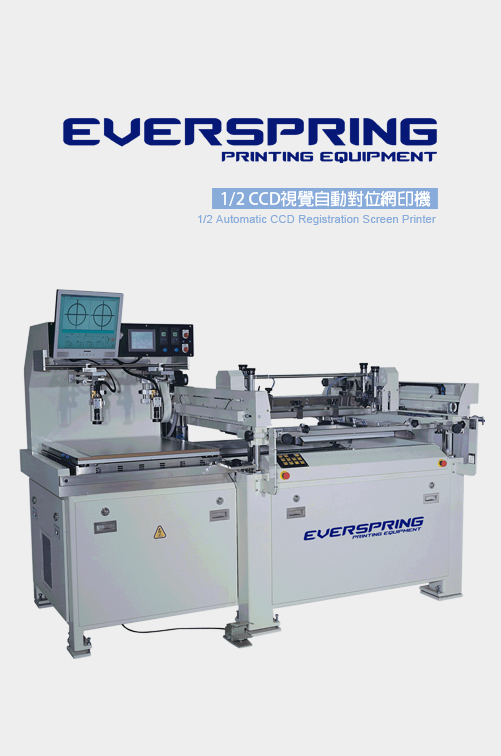 (C) 2010 Everspring Printing Equipment CO., LTD. All Rights Reserved.